Pakistan is one of those Asian countries where people crave for spice rich cuisine. Traditional food in Pakistan naturally possesses a wide range of spicy foods. Pakistani cuisine is rich with various kinds of scrumptious varieties. The kebab has a vital place in true traditional Pakistani cuisine. Some of the most famous kebabs include Seekh, Shami, Reshmi, Chapli, Bihari, Tikka, Chicken, Fish, Dhags, Doner, Pasanday, Peshawari, Qeema, and many more. Peshawari Kebab aka Chapli Kebab is very popular among Pakistani Pashtuns in Peshawar. In Peshawar it is famous street food easily available through out market specially in Qissa Khwani Bazaar. You can see many merchants and vendor selling kebabs made of lamb meat and cooked in it's own animal fat for true flavors and miles away spreading aroma. 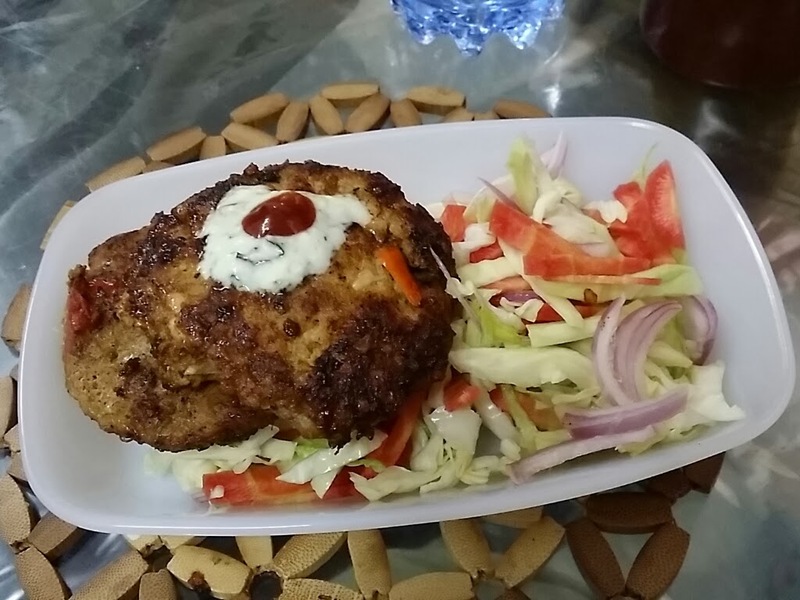 Peshawari Chapli kebab is a kind of meat patty. 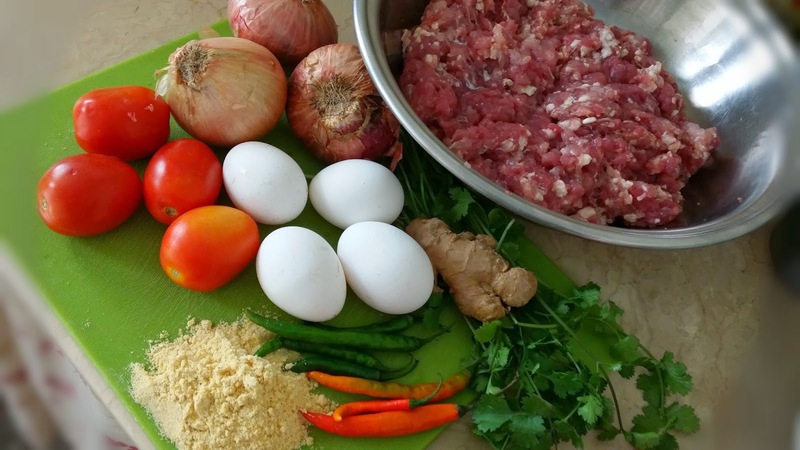 The meat can be of beef, mutton or chicken together with loads of ingredients like salt, onions, tomatoes, green chillies, coriander seeds, cumin seeds, black pepper, lemon juice, eggs, pomegranate, cornstarch, maize flour and coriander leaves. These days there is a growing trend of cooking shows in Pakistan in which famous chefs make dishes live and provide people the opportunity to cook in a professional way. I have adopted my maternal grand mother's recipe and learned by my mother because both of them have spent some time of their life in Peshawar. I have used beef mince because it was available at home and preferred plant fat for frying rather animal fat. Both fats have cholesterol but animal fat has high cholesterol compare to plant fat. You may buy plant oil with zero cholesterol but I never see animal oil with no cholesterol. - Cut the onion, chillies, coriander and garlic do not worry about the big chunk size because all is going to blender soon. Mean while in separate bowl season the mince with salt, pepper, gram masala, cumin, coriander, pomegranate and dry mint and mix well. - Give vegetables a good blend not too much otherwise onion will leave its water. 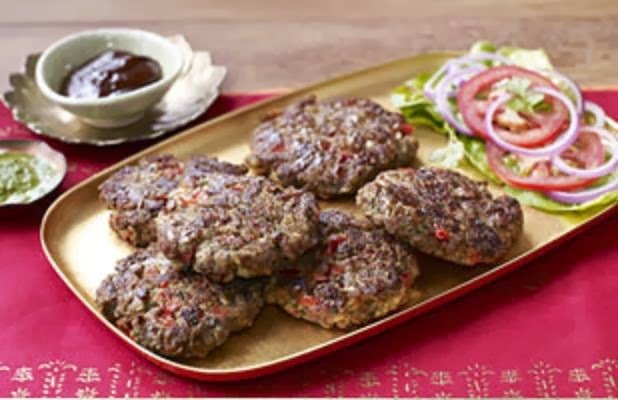 At this point there are two ways first - if you like patties to be made of very fine mince then add mince to finely chopped vegetables and grind well, second - if you like little bit grainy vegetables and mince patties then mix it manually. I prefer former method because it give patties very good mix and soft texture. - Mix finely chopped tomatoes remember to remove seeds from tomatoes, add chopped hard boiled eggs and maize flour and mix. - Make medium size thin patties, mean while in heavy skillet heat oil that the patties get dipped to half of its thickness and fry in batches. Cover the pan with lid for 3 minutes let them cook till golden brown, repeat the process for the other side too. - Serve hot with naan, mint chatni, ketchup and raw vegetable salad. Enjoy...! -Maize flour is the main ingredient of Peshawari Kebab it's main purpose is to soften the patties and absorb excess moisture of material. If you don’t have maize flour replace it with parched gram, if u run out of both types then least choice is of simple wheat flour there might be little bit difference of flour but the purpose can b fulfilled. -Must cover the pan because boiled eggs bursting can cause splitting of oil droplets due to protein denaturing.